There’s a long list of specified rules under various sections that declares an unregistered or unauthorized social organization as a uniform phrase called ‘NGO: Non-Governmental Organization’. 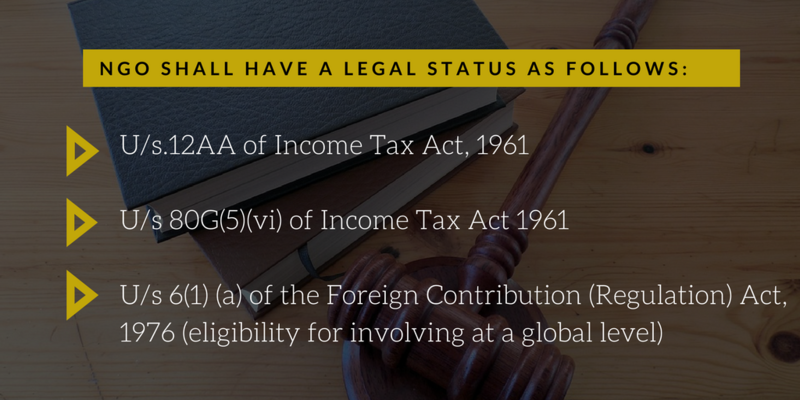 The legal status that an NGO holds matter a lot while making a charity or donations. There are many reasons to support the statement that we will be discussing in this blog. “As per section 12(1) of the National Trust Act any voluntary organization or the association of parents of persons with disabilities or the “Association of Persons with disabilities working in the field of autism, cerebral palsy, mental retardation and multiple disabilities” already registered under the Societies Registration Act, 1860(21 of 1860), or section 25 of the Companies Act, 1956(1 of 1956), or as a Public Charitable Trust and under Persons With Disability Act, 1995 in the concerned state can apply for registration in National Trust”. 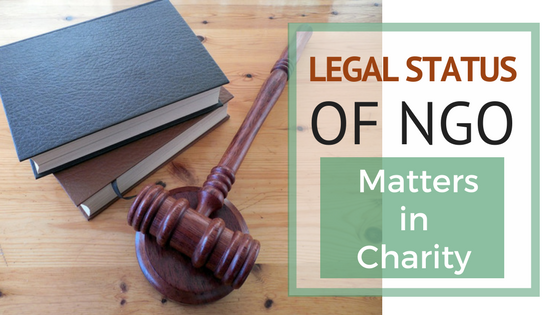 How Legal Status of NGO is important in Charity? The authenticity is very important to know where your donations are being utilized. So if the NGO is a registered one, you will have a kind of trust with the NGO. You will be relaxed knowing that the money is being utilized by for a genuine purpose and you don’t necessarily have to follow up or cross check. In our blog, Tax Benefits in Charity we mentioned about the kind tax deductions are available for the people who make charity. But only if the NGO or organization is registered one. Otherwise, there is no eligibility for the deductions. This is why the legal status of NGO is to be verified before making a charity. Whenever a charity is made to NGO that has a legal status, the donor and the NGO are bounded in a legal agreement and thus the topic of ‘Infringement’ can be made. If the NGO is not a legal one, then the donations made are not counted in terms of the law. Seruds NGO has legally established itself in all the sections mentioned in the blog. See the full legal status of NGO: Seruds. Donations made to Seruds NGO are fully reliable and secured. Start donating now. Click on the donate button available on the top right of the website and contribute towards society.